Today’s Final Jeopardy answer and question (20th Century Transportation), the July 3, 2017 game between Emily Campbell, Trevor Schultz, and 1-day champion Jon Eisenman. Help support The Jeopardy! Fan and become one of our Patreon supporters! 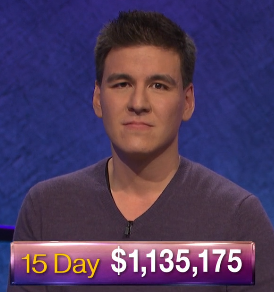 James Holzhauer qualified 100.000% of the time. Eric R. Backes qualified 96.870% of the time. Anneke Garcia qualified 85.377% of the time. Lindsey Shultz qualified 56.033% of the time. Dave Leffler qualified 22.900% of the time. Jonathan Dinerstein qualified 8.258% of the time. The Jeopardy! Fan is created by fans, for fans. The Jeopardy! game show and all elements thereof, including but not limited to copyright and trademark thereto, are the property of Jeopardy Productions, Inc. and are protected under law. This website is not affiliated with, sponsored by, or operated by Jeopardy Productions, Inc.